The secretary of state reportedly was so frustrated with President Trump that he allegedly called him a “moron” in a meeting with national security and Cabinet officials. Unless your work life has been blessed by a steady stream of competent, compassionate managers, you may be able to see a bit of yourself in Rex Tillerson. After all, who among us hasn’t taken a private moment with a trusted colleague to vent about the boss? The secretary of state reportedly was so frustrated with his boss — President Trump — that he allegedly called him a “moron” in a meeting with national security and Cabinet officials. This may not have been a major problem — as I said, “who among us?’’ — except that NBC News found out. And another report noted that it wasn’t just a standard-issue “moron,” but one with a particularly fractious expletive attached. Yikes. What happens in Centcom apparently does not stay in Centcom. So what do you do when your boss hears reports that you called him a [bleeping] moron behind his back? Tillerson’s choice — give a strange, hastily arranged press conference at which you neither deny the insult nor apologize for it — would seem to be sub-optimal (a spokesperson hours later denied it on his behalf, sort of). So I e-mailed Alison Green, author of the popular and delightful Ask A Manager blog, with a few hypothetical questions about a hypothetical employee hypothetically calling his boss a [bleeping] moron. On her website, Green thoughtfully answers queries from the public about things like how to follow up after a job interview and what to do if the woman you broke up with suddenly and horribly many years ago has just been hired to be your boss (that last one went viral). This is somewhat concerning, considering that Tillerson’s entire job is delicate international diplomacy. If indeed he needs “to work on being more unflappable and having more of a filter,” as Green put it, then it may be time to start digging fallout shelters. Mercifully, that is not the only option. Such a comment about your boss, if it was an honest appraisal, should probably cause you to consider whether you want to continue your employment. And how do you tell if your work situation is toxic? “If multiple people in your office are leaving under fraught circumstances, and if your boss routinely shows no loyalty or respect to people, the problem is your workplace and its leadership,” she said. . . . Hypothetically, of course. 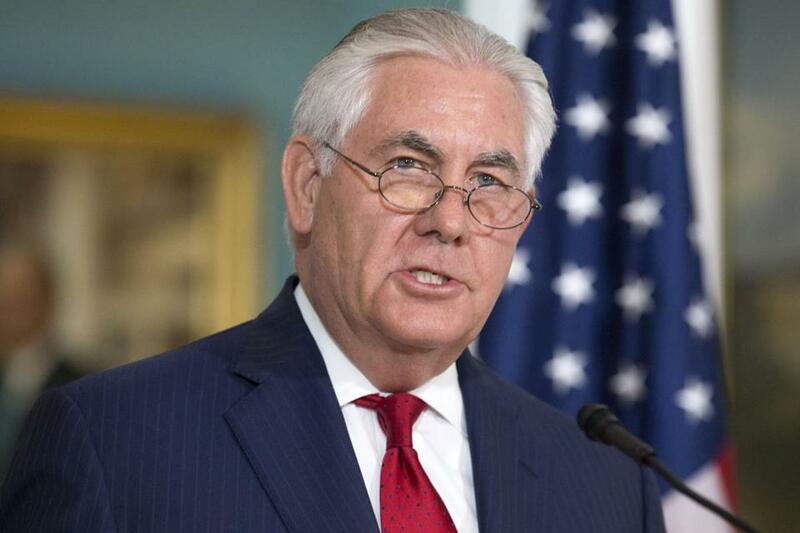 Tillerson on Wednesday appeared to foreclose that possibility and denied that he’d ever considered resigning. He spouted some sort of homespun nonsense about his own childlike naivete in the face of Washington’s ferocious backbiting machine. “I’m not from this place,” said Tillerson, who somehow managed to be the CEO of Exxon Mobil after, apparently, a lifetime spent trappin’ beavers and waitin’ on the harvest moon or whatever. These big city ways are a mystery to a simple oil man, who reportedly made $24 million last year. Some amount of venting is normal, said Green, like the kind of frustrated griping nearly all of us do quietly from time to time (not me though, my boss is great). But it shouldn’t be a regular thing. And if you’re also a manager — hypothetically, let’s say the head of a particularly stately department — then you have to be especially carefully whom you’re complaining to. “That said, there’s a point where a higher-up is so widely known to be toxic or terrible that you’ll lose credibility if you don’t acknowledge that,” Green said.